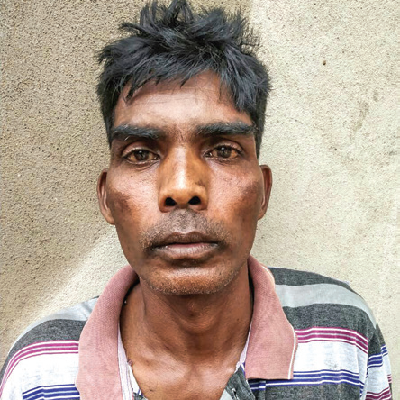 In yet another murder involving migrants, a 36-year-old construction labourer from Jharkhand Thaddeus Barca was done to death at a construction site at Varca last night. In swift action, the Colva police led by PI Filomena Costa nabbed the accused, Ignatius Ming (40), also hailing from Jharkhand. The motive behind the murder is slated to be an argument over payment of money towards the purchase of grocery by the deceased to the accused. A wooden rafter was used to hammer the deceased to death. Briefing the media, Colva PI Filomena Costa informed that the murder came to light on Monday morning after the police received a phone call from one Joaquim Gonsalves, stating that one of his labourers had been killed at the construction site at Guneaowaddo. “The Colva police team along with forensic experts and sniffer dog rushed to the site to carry out investigations. We found the dead body of Thaddeus Barca lying in a pool of blood,” he said, adding that the police immediately rounded up seven persons in connection with the murder. Replying to a question on what lead to the murder, PI Costa informed that an argument broke out between the deceased and the accused over the payment towards the purchase of grocery. He said the police have recovered the wooden rafter, the weapon of assault. “We spotted blood stains on the wooden rafter. The same has been attached as part of the investigations,” he added. To another query, PI Costa said that the deceased sustained two injuries on the head, adding that the post-mortem examination will reveal the exact cause of death and the number of injuries on the body of the deceased. SDPO DySP Raju Raut Desai, visited the spot and helped in the investigation.